We've posted the rulebook for Car Wars Classic, in handy PDF format. Get your free copy right here! Car Wars Classic Counter Set -- A fantastic companion to the classic rules. Need physical components? Here they are! Car Wars Arenas -- The Kickstarter rewards have been shipped and you'll soon see this new expansion in stores. Uncle Al's Catalog from Hell -- The monster guide to weapons, accessories, and Car Wars tools is available now in PDF. 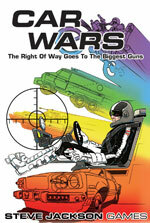 You can find the complete list of available Car Wars supplements right here.